Welcome to our new tutorial series from guest blogger Knitting Sarah! 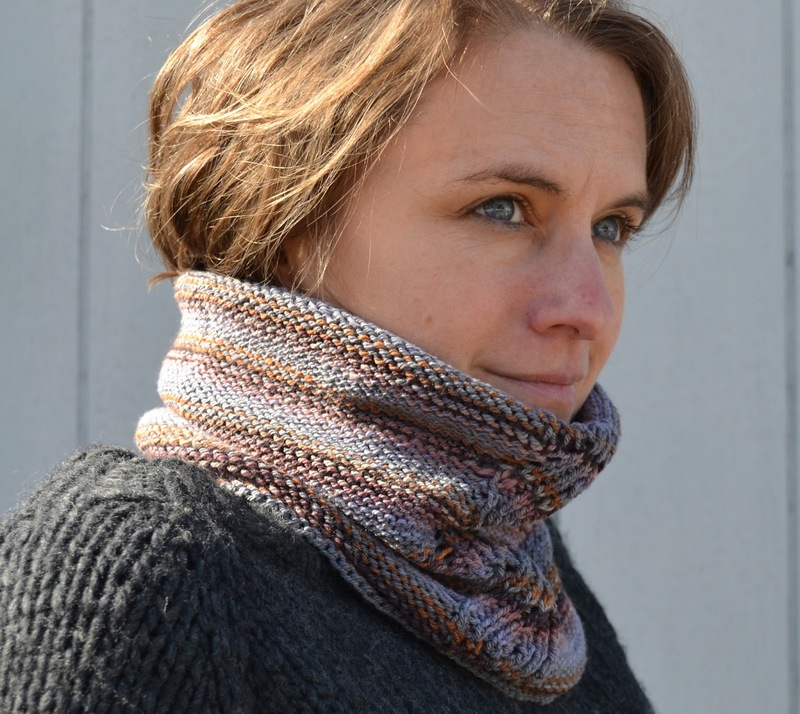 Sarah is a popular blogger based in Wisconsin, and she will be sharing her knitting know-how with you in this ongoing series. This is her second such post; click here if you missed her inaugural post about swatch knitting. Bijou Bliss, a 50/50 yak/cormo blend, is the very first yak yarn I bought. Like many, I actually made my first purchase with very little idea of what I would knit with it – it was just so warm and soft that I simply had to try it. I grabbed two natural brown skeins and promptly brought them home. We all buy yarn like this sometimes and it’s these types of purchases that can make finding a suitable pattern an interesting challenge. It’s one thing to purchase yarn for a pattern, but it’s a whole other situation when you buy the yarn with no plan in mind. So what do you do when you make this sort of purchase? Realizing no one knows this yarn better than those that create it, I can trust that if they’re telling me this yarn does marvelous things with stitch patterns, it certainly wouldn’t hurt to seek out some patterns with interesting texture & stitch patterning. Armed with this insight, it was time to knit a swatch. If you’re truly starting from scratch, you can find needle size recommendations on the ball band of your yarn and start your swatch there. It can be as simple as knitting a 4”x4” square of stockinette or, if you think you might want to knit in the round, you can whip up a little cuff in the round. If you’re having fun and want to explore further, you can also grab your nearest stitch dictionary and play with stitch patterns – really there’s nothing stopping you! Knitting & washing a swatch or swatches lets you get a feel how the yarn knits up as well as allows you to garner important information like gauge, how the yarn changes with washing, and its stitch definition. It’s a window into discovering what makes a yarn really shine. Once you’ve got a basic working knowledge of your yarn, you’re ready to find the perfect pattern. After swatching with Bijou Bliss I could see the beautiful stitch definition and I knew that this yarn blooms just enough to make it super cozy & soft. In every project, when I start to formulate what kind of pattern to look for, I always take what I’ve learned from my swatch & the recommendations I’ve read and I imagine what type of project would make the most of the yarn at hand. That’s the key to incredible knitting projects after all, finding a marriage of yarn & pattern that showcases what makes the yarn special. In my mind, I was thinking my ideal Bijou Bliss project would incorporate the key aspects that make this yarn unique – its warmth and softness, the slightly rustic appearance of the natural brown, & its stitch definition. There are many ways to start a seeking out a pattern and one of my favorite places to begin with a new-to-me yarn is a general search for the weight of yarn and yardage just to see all my options. From there, I can start narrowing the field based on the options I’m find. 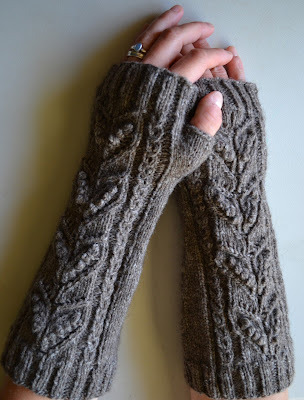 In the back of my mind I’d be hoping to find some fingerless mitts with a pretty motif for my Bijou Bliss, so when I came across the Ashbury Mitts in my search I was pretty sure I had exactly what I was looking for. 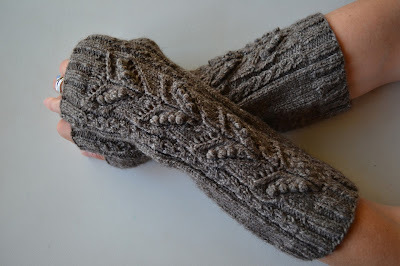 The Ashbury Mitts were actually created with Bijou Basin Ranch’s Lhasa Wilderness in mind, but I had a hunch that it would work equally well with Bijou Bliss. I started knitting and my hunch was confirmed. The combination of texture set into these relaxed mitts played right into the hand of this yarn. It’s no coincidence, of course, that this pattern worked well. After all, the Ashbury Mitts met the criteria of my search exactly – lots of texture & stitch patterning to showcase the exquisite stitch definition and something that would play-up its warm & cozy nature. The Bijou Bliss gives this pattern a more rustic flavor than its original version, but that’s exactly what I was hoping. The mitts turned knit up beautifully. What began as an impulse purchase of some gorgeous yarn, ended up leading me down the enjoyable, educational, and rewarding path of getting to know a new-to-me yarn. It’s takes time to really get to know a yarn, but it’s so worth the time investment. The journey of knitting my Ashbury Mitts has also got me thinking about more ways I can use the incredibly lovely Bijou Bliss. Yes indeed, I see a bright future and a lot more texture in my future with this wonderful yarn from Bijou Basin Ranch.